There’s a really, really rich guy named Kris Singh who loves to buy very exclusive, very expensive cars. This is a guy who dropped $4 million on a Lamborghini Veneno before he even saw one, and he’s the only guy who owns a Koenigsegg Agera XS. Also, he’s about to acquire an Aston Martin Valkyrie, which he plans to cover in moon dust, as one does. Dude, the crews of Apollos 15, 16, and 17 would like a word with you about that “first person to drive on the Moon” thing. Anyway, the questions that really matter here, of course, are where the hell did this guy get a lunar rock and how much did he pay? Is it legal? How much lunar material did he get? I reached out to Singh, who was happy to talk to us about his inspiration for the car, his excitement about the Valkyrie and space travel in general—but would not comment on the amount or source of his moon rock. So, okay, nobody actually involved is talking. We’ll have to try and work backwards. 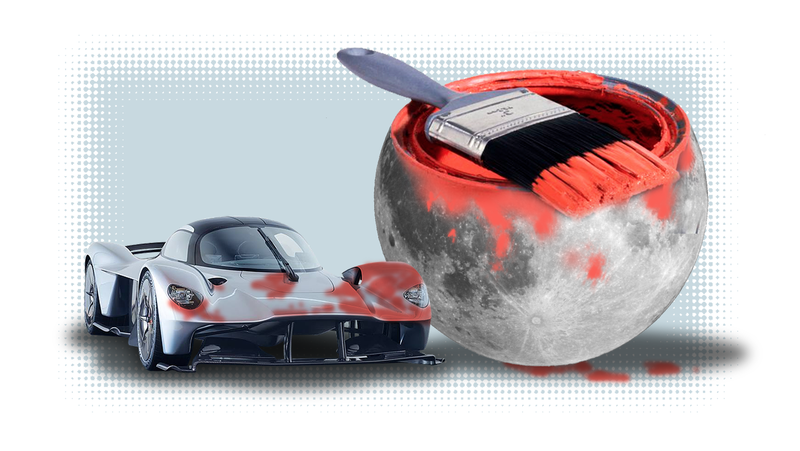 First, let’s figure out just how much moon dust you’d need to mix into the paint to cover a car roughly the size of the Valkyrie. I called a bunch of specialty body and paint shops, and the consensus seemed to be that, when mixing a small, particulate material into paint (mica was the most commonly referenced substance), you need about three ounces to get enough coverage. So, whatever this moon rock is, it has to be at least three ounces of moon. We know that the Apollo missions brought back about 842 pounds of moon rocks from 1969 to 1972, but none of this officially ever ended up in private hands. In fact, it’s illegal for a private citizen to own any Apollo-sourced lunar material. There have been a few high-profile cases of moon dust or rocks showing up for private sale; the most famous case of this was back in 2002, when some NASA interns stole 10 ounces of lunar material and attempted to sell it; they were caught. I spoke Cynthia Evans, the Division Chief of the Astromaterials Research and Exploration Science (ARES) Division at the Johnson Space Center (JSC). She insisted that every single Apollo sample is accounted for, including all of the 270 Apollo 17 “Goodwill Moon Rocks” that were given to various nations by the Nixon Administration. A good number of these are often alleged to be missing, but Evans refuted that idea completely. Even if we say, hypothetically, that the moon rock Singh has came from an Apollo mission, it’s worth noting that the cost of such material would be, um, astronomical. During the 2002 trial of the attempted theft of the NASA moon rocks by the interns, the cost of moon rocks were calculated at $50,800 per gram, which would be about $1.4 million per ounce, so for the three ounces needed for the paintjob, we’re looking at about $4 million. That’s about $1.2 million more than the $3.2 million, 1,130 horsepower hypercar itself. I’m not sure that’s the way to go for this. The Soviets brought some lunar samples back as well, via their series of robotic sample-return Luna probes. The volume of their lunar samples is far less than what NASA holds: in total, the three Luna probes returned just over 300 grams of lunar material, or about 10 ounces. While that would be more than enough for the paint job, only a very small amount of Luna-sourced moon stuff has been sold to the public back in 1993, which was just 200 mg for $442,500. That Soviet sample wouldn’t be nearly enough. So, if NASA insists it can’t be theirs, and there wasn’t nearly enough Soviet moon dirt to do it, what’s the other option? Meteorites! Yes, chunks of the moon very occasionally come to Earth all by themselves, and it is possible to extract lunar material out of them. Most are collected in Northern Africa and Oman, and are exceedingly rare. Only four minerals - plagioclase feldspar, pyroxene, olivine, and ilmenite - account for 98-99% of the crystalline material of the lunar crust. [Material at the lunar surface contains a high proportion of non-crystalline material, but most of this material is glass that formed from melting of rocks containing the four major minerals.] The remaining 1-2% is largely potassium feldspar, oxide minerals such as chromite, pleonaste, and rutile, calcium phosphates, zircon, troilite, and iron metal. Many other minerals have been identified, but most are rare and occur only as very small grains interstitial to the four major minerals. So, based on all this, the most likely source for this alleged moon rock is from a lunar meteorite. It’s possible to collect the needed three ounces and have it tested and confirmed to be genuine, which perhaps has been done. As far as how much these moon rocks would cost, it seems, according to Geology.com, that lunar meteorites go for about $1,000 per gram. That would mean that to get the needed three ounces, Singh would have dropped about $85,000—a much more reasonable sum. With all this in mind, my best guess is that the “moon rock” is a lunar meteorite, and likely cost somewhere between $75,000 to $100,000 for the materials, not counting the cost of analysis and verification, or the cost of the luxurious velveteen pouch the moon chunks came in. To put it simply, moon rocks look like... rocks. Regular, grayish, dull rocks. So, while the concept of mixing lunar material into paint is certainly compelling, the end result isn’t going to be some metal-flake festival of color and light; it’s going to be paint with gray dust mixed in. I suspect that Karosserie will do a lot to make the paint look incredible, but most likely none of that will be thanks to the moon dust mixed in. Whatever. It’s his money. Enjoy your new car with pre-dusted paint, Kris!